Industry News & Insights > What you need to know about UL Classifications? UL classifications are used across many industries, however what does the classification mean for customers. Why are UL classifications important? Underwriters Laboratories (UL) is a leading independent organisation which tests and certifies product safety. Every year the company examines over 19,000 types of products, components, materials and systems. UL classifications indicate the product is safe and has been tested and evaluated against specific properties and hazards. Once a manufacturer has passed all tests within a given standard, they will be given the UL mark. A product with the UL mark provides customers with confidence and reassurance in the products safety. Audits are performed on a regular basis by an independent test laboratory to ensure the product continues to follow relevant guidelines and compliance with the UL. One of the most widely recognised testing standards is UL94; the flammability standard for plastic materials used for parts in devices and appliances. Manufacturers are increasingly choosing adhesives with a UL94 classification. Fire retardant adhesives can help extinguish the flames and slow the spread of a fire. Fire retardant adhesives can be used for potting and encapsulating electronics, for cladding and flooring and bonding composite panels, fixtures and fittings in aircrafts and other transport. UL94 is a material burning test and can be either a Horizontal Burn (UL94 HB) test or Vertical Burn (UL94 V) test. 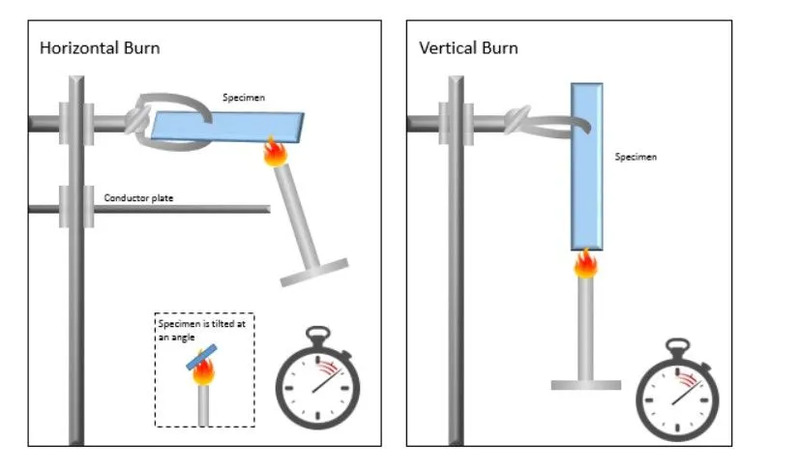 In both tests, an open flame is applied to the specimen for a set amount of time. The tests are used to determine the material’s behaviour to extinguish or spread the flame. The material is classified according to HB, V0, V1 or V2 and the thickness of the specimen is taken into consideration. 5VB and 5VA classifications are related to a bonded panel rather than an adhesive. A material that complies with the UL94 V0 rating is considered more flame retardant than the UL94 V2 rating. 5VB: (vertical plaque specimen) burning stops within 60 seconds, no drips, plaque specimen may develop a hole. 5VA: (vertical plaque specimen) burning stops within 60 seconds, no drips and the plaque specimen may not develop a hole. At Antala, we have many products that are tested and compliant to UL94 V-0 or UL94 V-1 and can be used in industrial applications where fire retardancy is essential. A polyurethane, halogen free, casting and impregnating system for pressure sensitive devices. An isocyanate free, epoxy-based encapsulation, impregnation and filling system for small transformers, filters, capacitors, coils and electronic circuits. A resilient casting system exhibiting good resistance to thermal ageing and good thermal shock resistance. Suitable for bonding induction components, transformer, generators and motors, pressure-sensitive components. A two component structural adhesive for bonding sandwich panels, wall cabinets, partition walls, transformers, drivers control panel and cables. A two component, brown epoxy casting system with high crack and thermal shock resistance. This system is used as an indoor electrical insulation material. A flexible, multipurpose epoxy casting system with good dielectric properties and resistance to temperature variations. This system can be used for generators and motors. A two component, epoxy encapsulation system with good thermal shock resistance and thermal endurance. This system can be used for encapsulating heat-evolving components. A high performance, neutral cure silicone sealant used as a formed-in-Place Gasket (FIPG) material.